Rebecca Gary, PhD, RN, FAHA, and Susan Shapiro, PhD, RN, professors at Emory University's Nell Hodgson Woodruff School of Nursing, were inducted into the American Academy of Nursing (AAN) Fellowship during a formal ceremony at the AAN’s 39th Annual Conference and Meeting in Washington D.C. in October. Induction into the AAN Fellowship is one of the highest honors in nursing. Fellows are considered nursing's most accomplished leaders in education, management, practice and research. They are elected through a highly selective process that recognizes individuals who have made major contributions to nursing and health care and whose work has influenced health policies benefiting all Americans. 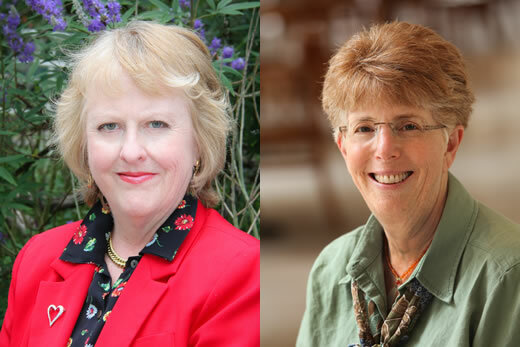 "I am extremely proud to celebrate the induction of these new fellows who have both made a significant impact on health care and research," says Linda McCauley, PhD, RN, FAAN, FAAOHN, dean of Emory’s Nell Hodgson Woodruff School of Nursing. "Emory now has 20 American Academy of Nursing Fellows, which is an impressive total for an internationally-recognized nursing school." Gary is an associate professor of nursing at Emory. She was one of the first nurse researchers to use exercise interventions to study diastolic heart failure in women. Her pioneering cardiovascular health research is helping to improve quality of life for heart failure patients, which is the leading cause of hospitalizations among elders. In 2009, she was named a Fellow of the American Heart Association. Shapiro is the assistant dean for strategic clinical initiatives at Emory’s School of Nursing and the director of nursing research and evidence based practice at Emory Healthcare. She is a nationally-recognized expert in evidence base practice (EBP) and emergency nursing. She has incorporated (EBP) into two of the nation’s leading hospital systems—the University of California, San Francisco Medical Center and Emory Healthcare. Her articles have been published in renowned publications including the American Journal of Nursing, Journal of Nursing Administration, Western Journal of Nursing Research, and AAOHN Journal. The AAN is comprised of more than 1,600 nursing leaders in education, management, practice, policy and research. The AAN serves the public and the nursing profession by advancing health policy and practice through the generation, synthesis and dissemination of nursing knowledge.